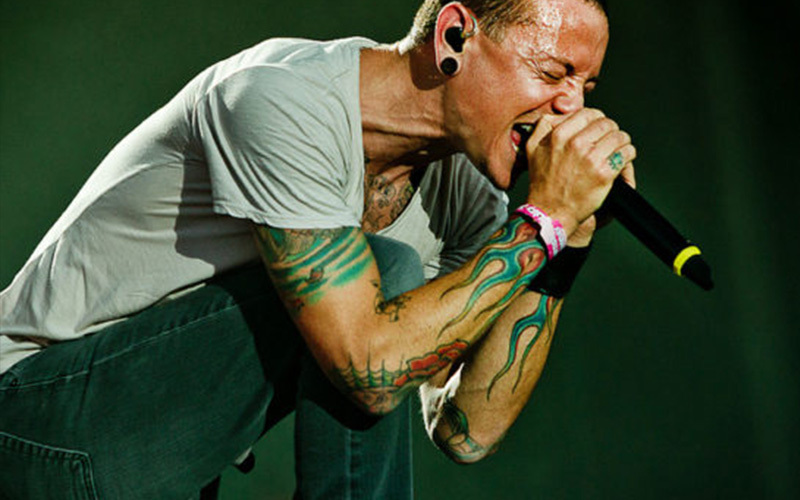 The late Chester Bennington is best known as the lead singer of Linkin Park, where his emotional and higher-pitched vocals accompanied the sounds of Mike Shinoda, the group’s main rapper. On July 20th, 2017, Bennington committed suicide by hanging. It is believed that Bennington had been having a hard time dealing with the suicide of his friend, Chris Cornell, lead singer of Audioslave and Soundgarden. Bennington’s suicide happened on the day that would have been Cornell’s 53rd birthday. Fans have been mourning his loss, whose pain and passion behind his voice and music allowed him to connect with fans all over the world. In order to make some money, Bennington started to work at Burger King and other odd jobs. In 1992, a gang broke into his friend’s house where he was using drugs and pistol-whipped his friends, which caused him to leave drugs behind. However, addiction eventually found its way back into this life later on. Bennington continued to dream of being a rock star – a dream that he had had ever since he was a child. He ended up joining a local Band called Grey Daze as their lead singer in 1993. The band developed a generous following with fans in the Phoenix area, however, Bennington became increasingly dissatisfied with the group and eventually left in the late 90s due to creative differences. Chester Bennington packed his bags and moved to Los Angeles. In 1999, he became the final member of the expanding rap-metal act called Linkin Park. Bennington was actually the one who came up with the band’s name replacing their former name Hybrid Theory, which became the title of their debut album. Hybrid Theory hurled Bennington’s musical talent into the limelight and gave him the much-deserved recognition as one of the 21st centuries most iconic music figures. Bennington was known for his high-pitched and emotional screaming, which often talked about his feelings of disconnect from the world. His addiction came back into the picture during the early stages of Linkin Park’s success. In an interview with The Guardian, Shinoda said, The tours we did in the beginning, everybody was either drinking or doing drugs. I can’t think of any that were sober. Aside from his work with Linkin Park, Bennington had side projects including Dead by Sunrise and supergroup Kings of Chaos. He also fronted Stone Temple Pilots from 2013 to 2015. In 2015 he left Stone Temple Pilots so that he could focus on his family and Linkin Park. Despite Chester Bennington’s openness about his battles with addiction and depression, those closest to him were shocked to hear about his suicide. Some of his friends feel as though they might have overlooked signs of Bennington’s dark side, or what he called his dark passenger. His friends said he suffered a relapse that lasted for three days in August, which caused him to black out from alcohol, and he had been drinking again since October. Bennington’s death continues to resonate amongst his fans, who experienced a worldwide shock wave when the news became public. The number of calls that the National Suicide Prevention Lifeline received on the day his suicide became public increased by 14 percent. If you or someone you know is battling addiction, depression or any issues that are affecting your mental or physical health, please reach out now. Contact The Dawn or call +66 63 048 4877 to find out more about our programmes or to get help today.